4/22/2019 6:32:05 AM - We had 5 days off until my next gig, a guitar duet with Higuchi-san in Fukuoka at a new boutique hotel called "With the Style." Strange name. We had decided to stay in Fukuoka in the Tenjin area as it was an easy area to get around with shops, restaurants, night life and transportation all within walking distance. We did nothing but sleep, eat, walk around, exploring various restaurants and shops, and basically wind down from the tour. I took Nikita one day to see a Japanese anime movie that was rehashed from the 80s starring the lovable Doraemon, which he and I both enjoyed. We also all went to an onsen (Japanese natural hot spring spa), also walking distance from our hotel, which was amazing. We rented our own "family bath" which had a private changing area and our own huge bath that looked like something out of the Miyazawa animation "Spirited Away." I have to admit that my favorite times were spent in the department basement food court areas ("depa-chika"), oggling over the various foods; just unbelievable. Finally March 9th came and we moved from the hotel we were staying at to "With the Style" hotel, about 20 minutes away. Seemingly in the middle of nowhere was this VERY posh boutique hotel, and I was shocked to see that they'd heavily promoted "Routes," even going as far as putting a copy of the CD inside the CD player in each room. Morokuma-san of Presence, our promoter, who I'd known and worked with for over a decade had seamlessly arranged for everything. It turned out that we were going to perform outdoors in the courtyard by the hotel pool. They'd set up outdoor heaters around us to keep us warm. After a very nice Italian-style lunch in their restaurant, we did sound check and I could vibe that we had a great sound system and engineer. It turned out to be the same engineer I'd worked with in the past in Fukuoka. Before our performance at 10:30 p.m., they took us out to dinner at an amazing Japanese restaurant run by the chef master and his wife who waited on us hand and foot. By far the best food experience this trip, so impeccably and carefully prepared. One of the dishes we had was a small fish "odori" (live) which was first drowned in the vinegar sauce it was served in that slightly shocked Sasha as the fish were still jumping around. At the end of the meal as we were leaving, the master presented Nikita with a little glass jar filled with water and a little stem of watercress with 3-4 of the little fish, which Nikita was so excited to get. Unfortunately his "pet" died after he slept, and he bravely flushed them down the toilet to return them to the ocean ala "Nemo." The performance went really well; my vocals were feeling supple, rested and strong, and Higuchi-san's playing was energetic and we really clicked well that night. I couldn't believe there were 700+ people there! That night I sold out on the rest of my "Naked Breath" CDs. 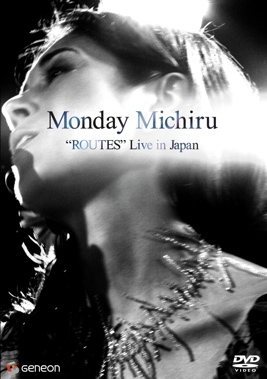 The "Routes" vinyls I'd brought along to Japan were sold out in Tokyo. It was a great end to a really positive tour.